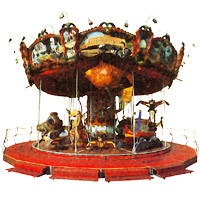 - Diameter of the carousel: 13 m.
- Calibration: 16 points, no hole in the ground. - Electricity: 380vv/32vA phase, up to counter the arrival of trucks. - Installation time: 4 days unless bad weather. - Dismantling time: 3 days unless bad weather. - Maximum age on the carousel: 12 years. - Supplies: 30 safety barriers. - Help on site: 2 people for installation and dismantlement. - Caution: the required presence of two trucks during installation and dismantlement. - Site closed for the parking of two semi-trailers (2 x 16m) during operation of the carousel. - Possibility for a caravan (8m) and a housing truck (7m) with water and electricity connection (220V – 30A) near the ride or on-site accommodation (2 bedrooms with double bed). 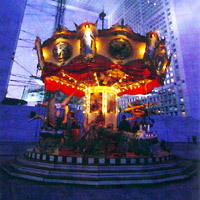 - Diameter of the carousel: 10m. - Electricity: 380 v/32A phase, electricity meter at the arrival of trucks. - Supplies: 20 safety barriers. - Help on site: 1 people for installation and dismantlement. - Warning: compulsory presence of the truck and trailer during installation and dismantlement. - Closed site for parking a truck (11m) and a trailer (11m) during operation of the carousel. - Possibility for two caravans (5m and 11m) and a workshop truck (10m) with water and electricity connection (220V – 30A) near the ride or on-site accommodation (2 bedrooms with double bed). - At night the carousel is closed with gates, guarding is unnecessary save in particular circumstances.